That photo above first appeared in my Instagram feed many, many moons ago. In fact, I think it may even have been about a year ago. It was a time when I was gearing up for a work trip interstate and my kids were feeling anxious over me going away without them. I left them in the trusted and very capable hands of their beloved Granny, however this was to be the start of a continuing journey with separation anxiety. 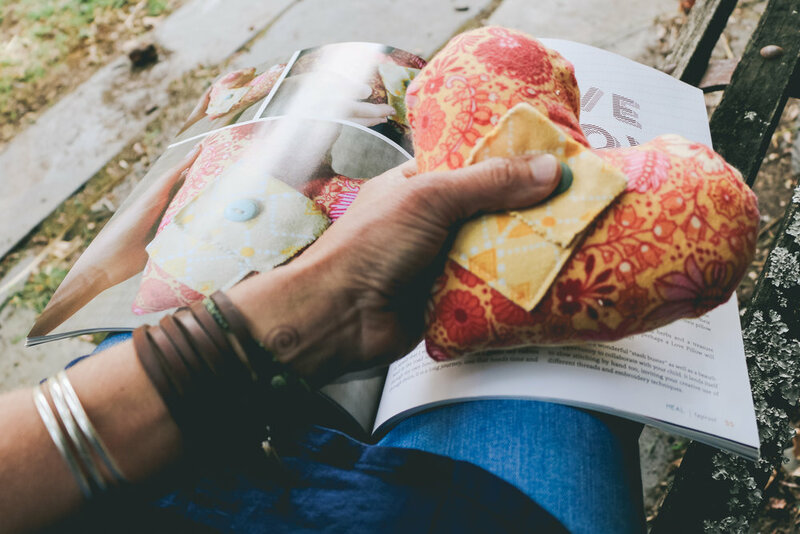 Months later, I found out that the theme for Issue 26 of Taproot magazine was HEAL and I thought a tutorial for the Love Pillows we made in the lead up to that trip, would make a perfect contribution. Lucky for me, they thought so too, however they very nearly knew nothing about it because as the deadline approached I found myself busy with Nature Play SA and Wild Ones mag and I wasn't sure if I'd be able to piece it all together in time. Taproot accept what's known in the mag world as 'on-spec' contributions. This is short for 'on-speculation' and what it means is that instead of pitching an idea and then setting to work on the article once it has been approved and all word counts, deadlines and fees have been discussed, you put the work in first and then submit your absolute very best version 'cold', with no guarantee of publication. I use to go hard with both approaches when I was first setting out on this writing adventure of mine, but these days I tend to prefer to pitch and have it be secured before I put the work in. However, Taproot is different! Taproot is worth doing the work and going in cold, with no guarantee. It's a publication that grows stronger with every issue and I have been a subscriber since the very first one. I absolutely adore it and this is the second time my words have been included in their pages and it makes me feel very honoured and proud to have their title in my portfolio. So going back to the looming deadline, I knew I wasn't breaking any contracts or letting down Editors by not submitting. But I also knew that I really wanted to contribute this piece, not only because if I didn't I would be disappointing myself, but mostly because there is so much I can offer around the topic of Healing. I actually had to choose between several different ideas for contribution, but a tutorial around these Love Pillows was definitely the standout. My only wish back then, was that I had taken photos the first time around but as it turned out, it is the detailed step-by-step images I took when repeating the making for this article that have been included and compliment the tutorial instructions so beautifully. So instead I feel ever so grateful for the few late nights I had but mostly to the Tradie who rescheduled on me that day way back last November. I was saved from having to deal with maintenance issues and constant interruptions and was instead, able to use the time for craft and photo-taking. Without that unexpected turn of events, it's unlikely this piece would have come together in time. Serendipity for the win! Childhood anxiety is becoming more and more widespread and there are many theories being documented for the reasons as to why. I have some of my own beliefs but have also recently learned* that anxiety is particularly prevalent in children between the ages of 8 - 10yrs. This is known to be a classic developmental stage where children feel excited, thrilled and intrigued by the newness of the young adult world they are stepping into, however it can very quickly become confusing, frightening and overwhelming. They then step back again into the childhood world that is so familiar to them, and one which offers comfort and reassurance but can also be frustrating and boring. All those feelings, all those emotions running rampant within the heart and mind of someone who is no longer a child, but not yet an adult. It's no wonder our little darlings get anxious, yes? Within our family, there is certainly an ebb and flow to our personal struggles with the anxiety beast and when it rears up inside my oldest, those feelings become incredibly consuming. For her, it's a compounding double whammy effect whereby her grief around the death of her dad gets mixed up with the fear of losing me, and then this is all muddled up with the extra sensitivities that come with her now being ten, the ripe developmental age for anxiety to be acute. Truth be told, sometimes it becomes a complete mess and the two of us simply ride the wave as gently and graciously as possible, which usually means lots of tears and cuddles. Our Love Pillows proved very effective for that weekend and have been slept with every night since. They are not a cure-all, but they absolutely do offer something. They offer comfort, support and understanding, but mostly they offer the little bit of extra Love just when it is needed most. You'll find my tutorial spanning pages 54 to 57 in this current issue of Taproot and it's accompanied by loads of pretty pictures with detailed instructions, and a list of the materials you'll need, plus tools and notions. There's also a backstory on why and how the original Love Pillows came to be but it's such fun giving a little behind the scenes insight here on the blog and through Instagram, don't you think? This latest issue was released last month but because of the international mail delay, I have only just received my copy and it's a ripper! So many inspiring recipes, tutorials and stories inside and if you are in the U.S, well you're the lucky ducks! It's widely distributed all around the States in what sound like pretty fabulous stores, but otherwise, if you're across big wide spans of ocean like us here in Australia, you can certainly grab yourself a copy through the Taproot online store, but for those more local to me, Tassie based Spiral Garden have it in stock too! * through our family naturopath who has deep roots in anthroposophical medicine and is not only a wealth of knowledge but also mixes us magical herbal tonics for all our various needs.